Angelina Jolie Could Be "Unforgiven"
Angelina Jolie has a spy thriller that's cracked the $100 million mark, and another one on the way. She's also developing a Bosnian War love story in development, and is now considering a remake of a British miniseries. "Unforgiven" is a three-part drama that aired on ITV1 in 2009 about Ruth Slater, a woman who tries to piece her life abck together after serving 15 years for the murder of two policeman. Now Christopher McQuarrie, the man who co-wrote Jolie's upcoming film "The Tourist" (co-starring Johny Depp), is adapting the story for the big screen," reported Deadline. Jolie apparently doesn't commit to projects until there's a script -- which sounds reasonable enough -- but the film is produced by Graham King, the man behind "The Tourist," so it sounds like a reunion is in order. 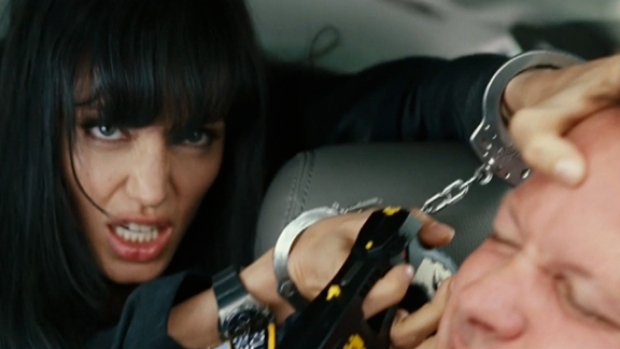 Angelina Jolie goes on the run after she's accused of being a double agent. We haven't seen the original, starring Suranne Jones as Slater, but the trailer looks promising, even if the Metallica soundtrack is a bit much. Jolie, currently starring "Salt," can next be seen in "The Tourist" Dec. 10.